A research participant showing us his mobile devices while describing the ways that he uses them. Grameen Foundation’s AppLab was a product development incubator that partnered with banks and mobile network operators worldwide. 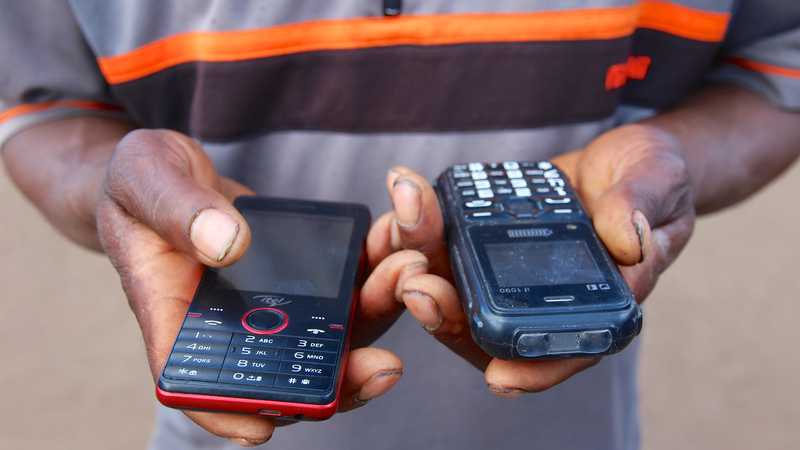 Using in-depth research and on-the-ground testing, AppLab developed mobile phone-based solutions to help the poor break the cycle of poverty. Developing internal training materials and toolkits for the Solutions Innovation Process, a holistic approach that combines human-centered design principles with scalable business practices. Leading research with Grameen Koota, an AppLab scaling partner in South India. Prototyping digital financial services with Centenary Bank and Pride Microfinance, AppLab’s scaling partners in Uganda. A video showing methods from our research process with Grameen Koota and CKS. The AppLab partnered with Grameen Koota, a socially-focused microfinance institution, and CKS, a Delhi based innovation consultancy, to uncover new customer insights and conceptualize a new financial product with the potential to reach at least 100,000 poor customers (roughly 25% of Grameen Koota’s client base). During my time on this program, I organized and led the first round of field research which included 40+ in-depth interviews in three districts in the state of Karnataka. Our research objective was to better understand the financial needs of Grameen Koota’s existing customers and their behaviors around borrowing, investing and day-to-day money management. Additionally, we sought to better understand product and service delivery and operational processes of Grameen Koota's branches and loan officers. Example slides from a research deck. In Uganda, the AppLab partnered with Centenary Bank, a commercial bank focused on extending its reach to the country's rural populations, and specifically to Ugandans living on less than $2 per day. 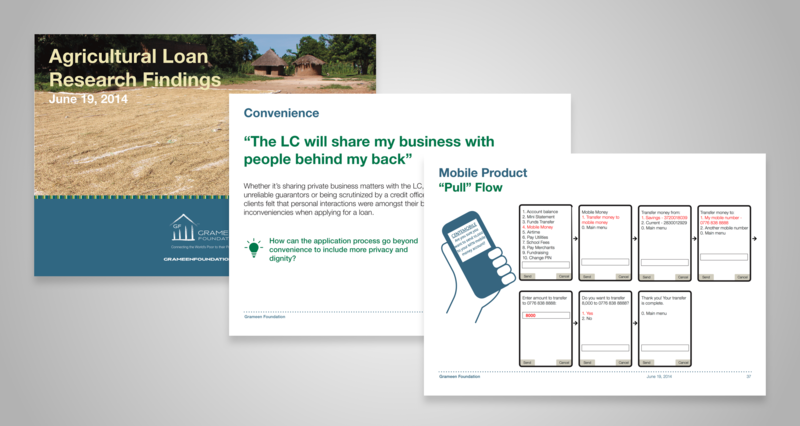 While working on this program, I led research to collect customer insights in order to develop new financial products leveraging Centenary’s existing mobile money channel. Also in Uganda, AppLab collaborated with Pride Microfinance to design, prototype and pilot a new digital savings and credit product called Save for a Target. Save for a Target was intended to appeal to those living on less than $2 per day. The savings account is characterized by a structured yet flexible commitment feature to help clients save lump sums to achieve savings goals. The product also provided access to small amounts of credit in the form of Emergency Loans. While working on this program, I led multiple rounds of field research and prototype testing and facilitated an experience mapping workshop with Pride Microfinance. Prototypes and customer journey maps. I was a Lead Designer at Grameen Foundation and collaborated with other members of the GF team including commercial analysts, software developers, project managers and local researchers.